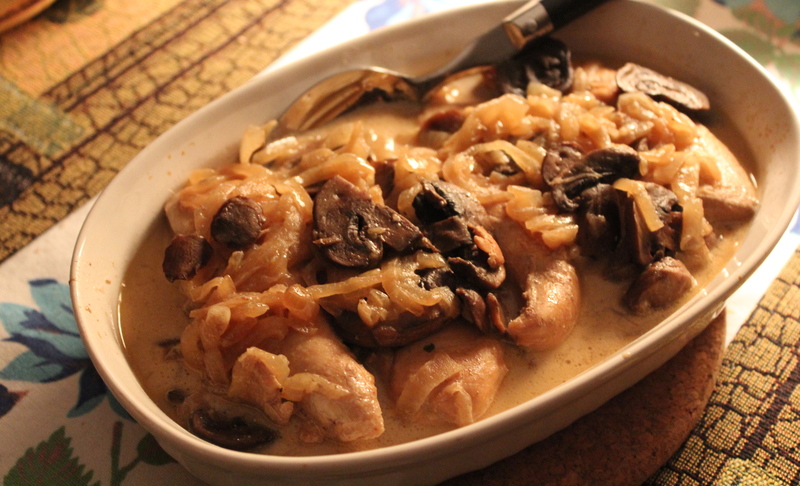 Chicken with mushrooms and onions in a balsamic cream sauce. Challenge day # 3 without a refrigerator. This is the requirement right now: cook with what you have on hand, ONLY. Going to the grocery store to fill in the blanks is not an option. Today these were the food items that had priority for usage: a package of 6 chicken tenders that had defrosted, a half-package of mushrooms, some light cream, and part of a can of chicken broth. To those ingredients I added 1 large onion, some balsamic vinegar and some butter to come up with what turned out to be a very good chicken dish. The chicken tenders worked well because they cooked quickly, and remained tender in the cream sauce. 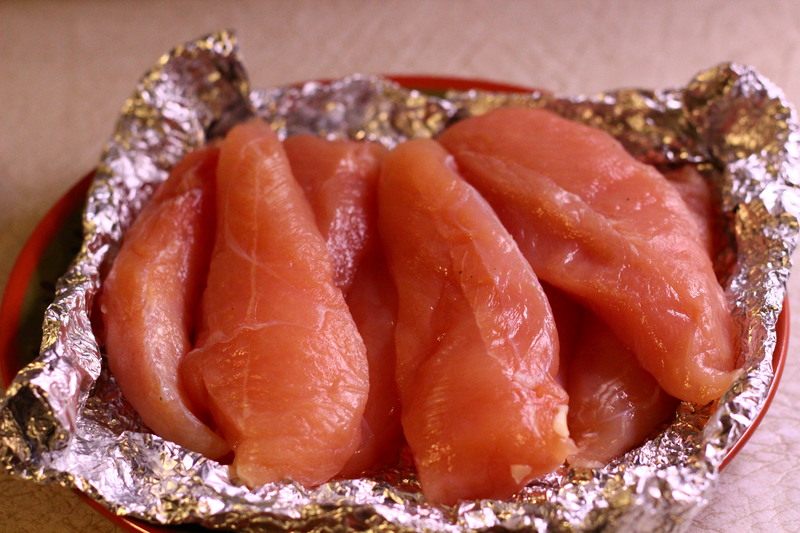 You could also use boneless chicken breasts, cut vertically in half, so they are not too thick. The amount of sauce is plentiful, so it’s a good idea to plan rice or noodles to spoon it over. I used a package of herbed rice pilaf with our meal. To go along with this I used up the leftover herbed butternut squash from day #1. Chicken tenders, at least 6 pieces, or 2 boneless chicken breasts, cut vertically in half. 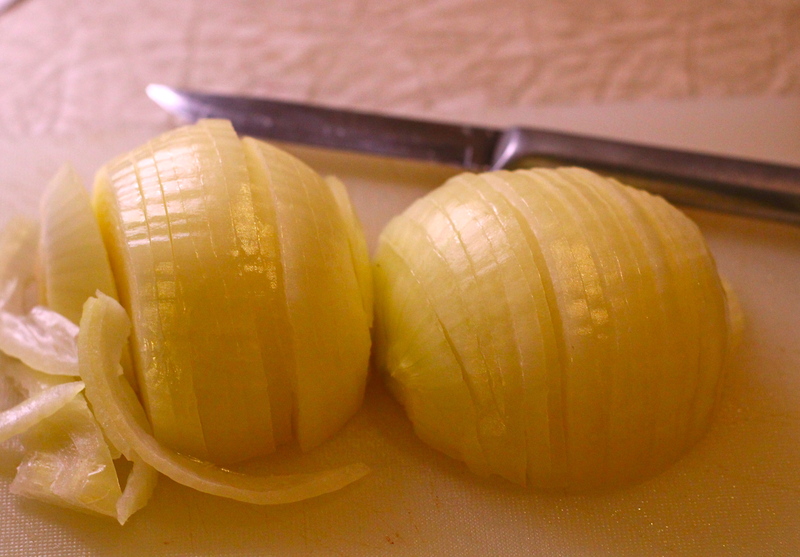 1 large onion, cut vertically in half, then sliced into “half-moons”. A large onion, cut into “half-moons”. 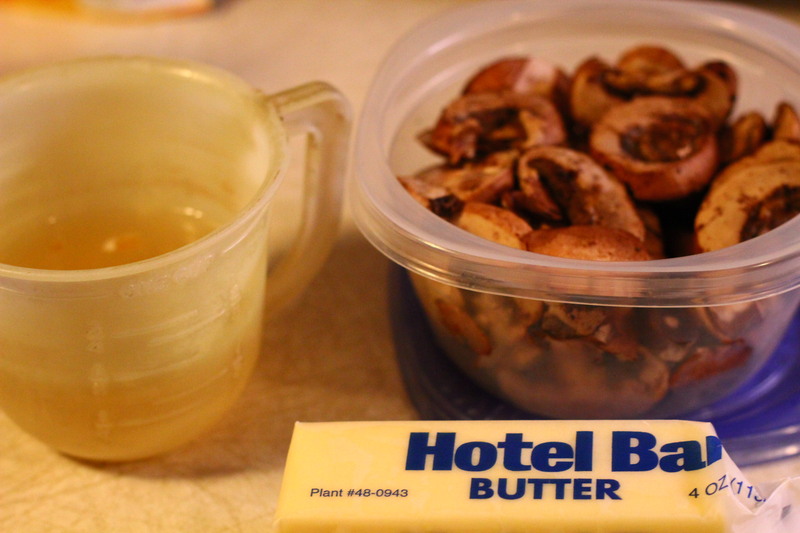 Mushrooms, butter, and chicken broth. 1. 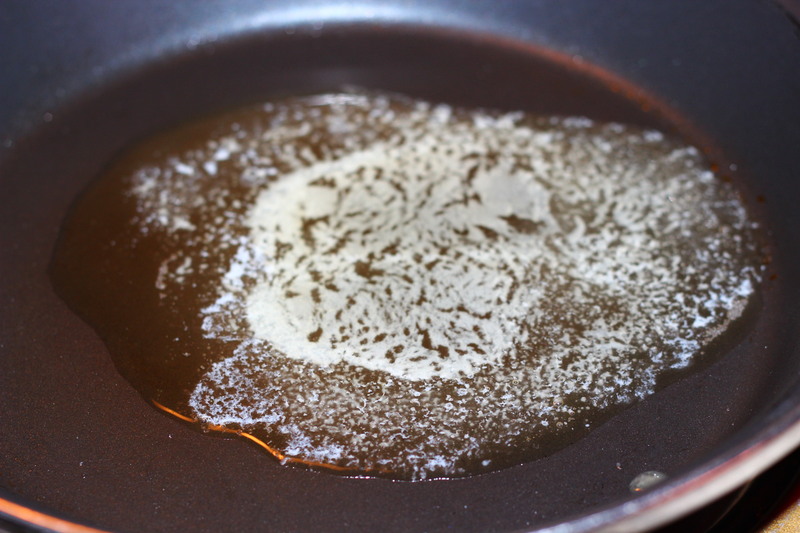 Over medium heat, in a large skillet, melt 1 Tablespoon butter. Hot skillet with butter melted. 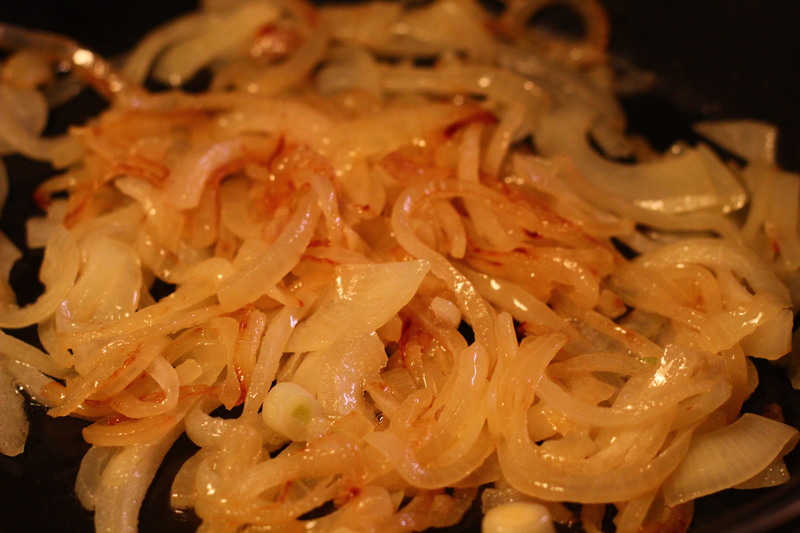 Add the sliced onions, reduce heat to low and sauté until nicely caramelized, about 15 minutes. Remove to a bowl, and set aside. 2. 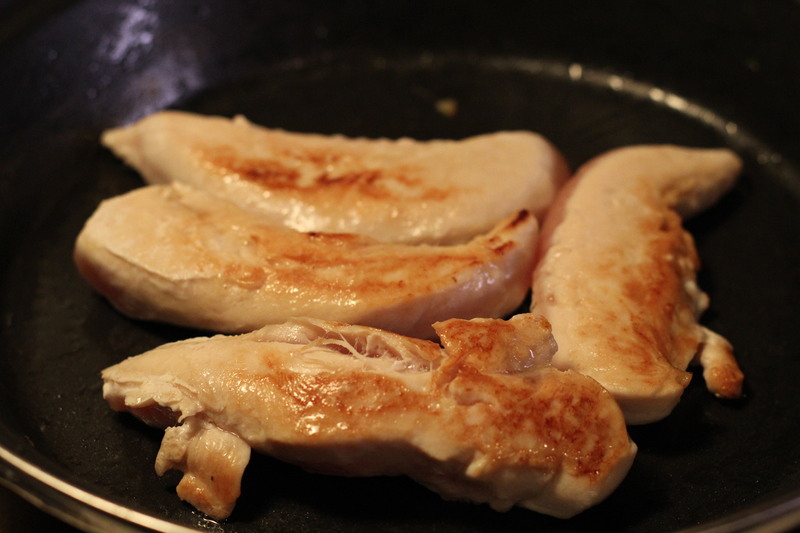 Melt the remaining 2 Tablespoons butter in the same skillet, add chicken pieces and cook to brown each side. Chicken will not be fully cooked at this point. Remove to a plate. Chicken browned, but not thoroughly cooked. 3. Deglaze the pan with the chicken broth, scraping up any browned bits into the broth. Add the cream and balsamic vinegar and stir. Add the mushrooms and salt and pepper. Decrease heat to low and simmer a few minutes. 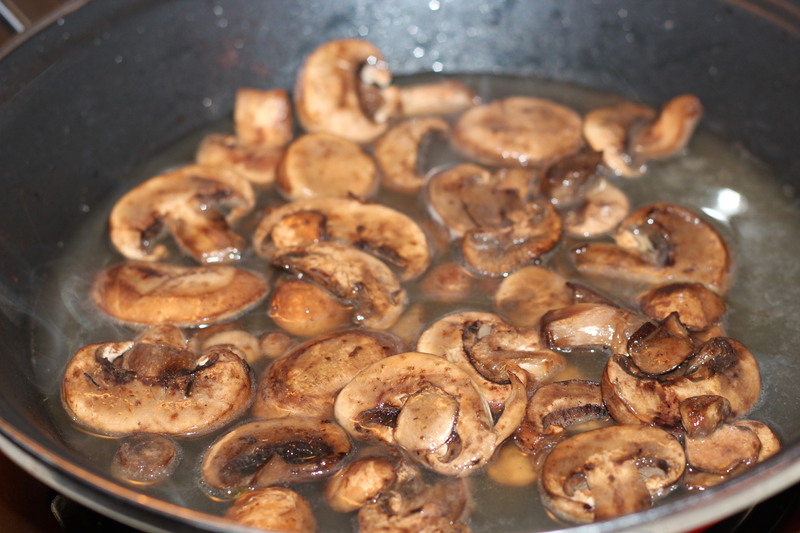 Saute mushrooms, add broth and cream. 4. Bring heat back up to medium. Add the chicken and onions to the pan mixture and cook the chicken all the way through. 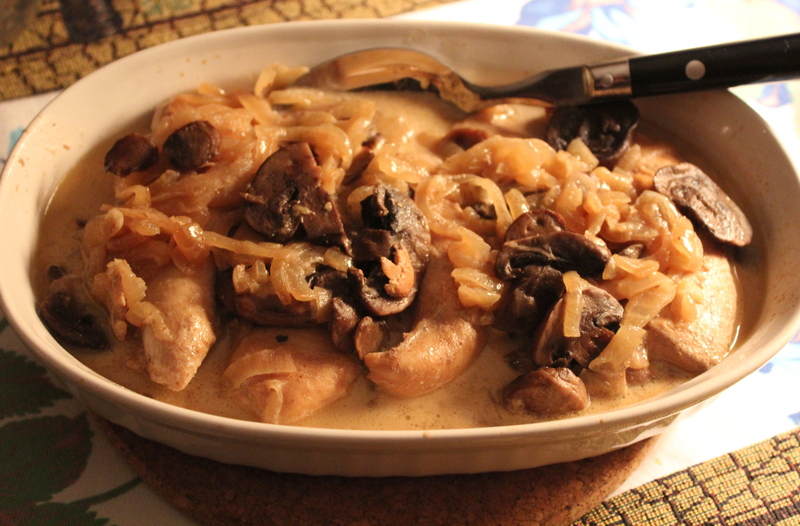 A satisfying dish of chicken, mushrooms and onions in a rich cream sauce. Our assessment of this dish? My husband said ” UHMMM! this is great”. But he loves mushrooms, so anything with mushrooms in it is AOK with him. I thought it was a very good combination of flavors. Most importantly for me is that the chicken remained moist and tender. I always worry about white meat chicken becoming dried out, tough and chewy, but this didn’t. The cream in the sauce smoothed out the tang of the vinegar, with the vinegar providing a dark color to the sauce. The mushrooms and onions rounded out the dish and were a good compliment over all. I’m glad I made rice to go with it to put the sauce on. I will definitely be making this dish again.